Help us bring more Italian experiences to you! We rely on your support through your contribution to enable us to continue bringing world-class programming to San Diego! As a member, you can help San Diego Italian Film Festival expand its reach into the community while supporting this extraordinary cultural treasure! We invite you to join us by becoming a member today! There are several levels of membership to choose from, and if you are a business, SDIFF can tailor your message with Italian creativity to shine light on you and on the SDIFF. All levels are valid for two persons in a household! For companies a special brand and message package can be created to demonstrate commitment to the mission of the San Diego Italian Film Festival. 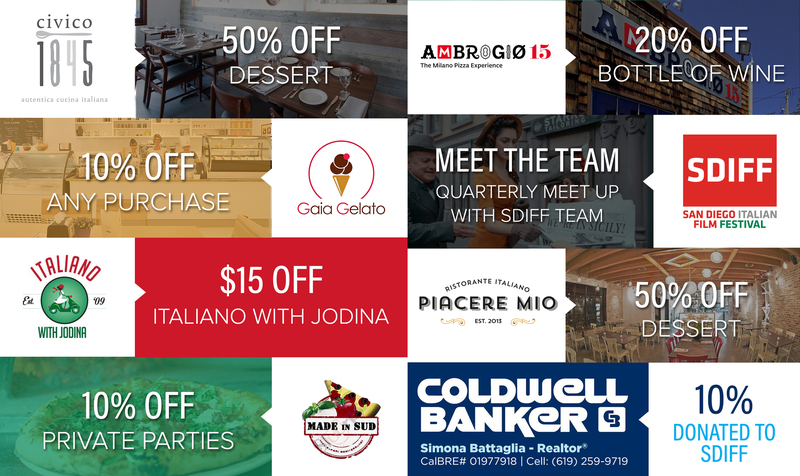 Now enjoy discounts from our community partners with your San Diego Italian Film Festival membership card! Please click on PAY NOW button below to begin your membership application. In order to start your membership application process please use the button below to pay. Your payment is secure, SDIFF uses PayPal as our payment partner to keep you payment and information secure. No need to be an account member with PayPal to submit your payments. After your payment has been processed successfully you'll be redirected to our member information form to finalize your application.